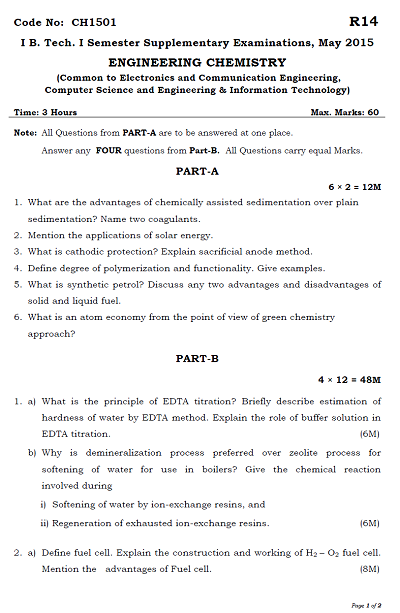 Note: All Questions from PART-A are to be answered at one place. 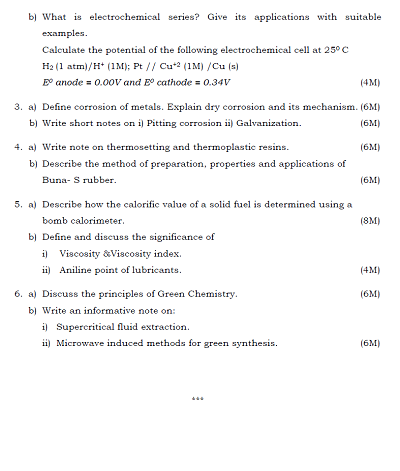 Answer any FOUR questions from Part-B. All Questions carry equal Marks. 1. What are the advantages of chemically assisted sedimentation over plain sedimentation? Name two coagulants. 2. Mention the applications of solar energy. 3. What is cathodic protection? Explain sacrificial anode method. 4. Define degree of polymerization and functionality. Give examples. 5. What is synthetic petrol? Discuss any two advantages and disadvantages of solid and liquid fuel. 6. What is an atom economy from the point of view of green chemistry approach?